I walked through the city. I walked past garbage bins and the bones of last year’s flowers. I courted oak trees. My ears opened, and opened again. I walked to the lake where I sat for a while watching an episode of gulls. A man on the boardwalk wore a well-cut coat and walked with his hands clasped behind his back, each step weighted like a stamp. An old woman fed the pigeons little cakes until they were pleasured and fat. It was so cold my breath became a picture. The songs closed over me; I disappeared. 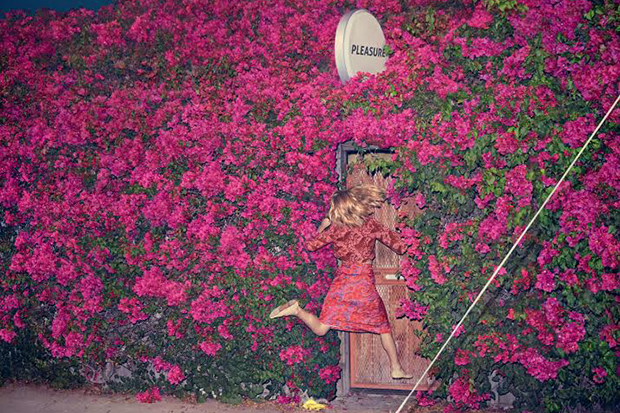 A windy power and beautiful incantatory spell travels through Feist’s new album PLEASURE. The unison voices and open endings. The ancient-modern corral of chant, spoken word, room sound, rushing footsteps, tough guitar, living world timbre, and doo-wop sway. I followed Feist’s voice on the trajectory of the swerve, streaking toward the sky, touching outer space, crossing dimensions. At some point, the air warmed and I dissolved. I had escaped the momentum of the clock. Listening had become truancy. I realized I might not graduate from my day. Pleasure is wild and elemental, a little heartsore, a little hungry. It sails between meticulous songcraft and abstract composition. It is full of sudden colours and tiny angles and luxurious canopies of sound. I’ve listened to this album a dozen times now: on a stalled streetcar at rush hour; alone in a crowd of trees; sitting at the kitchen table with my freshly shampooed son; late at night at the peak of a house, writing this. The lush force, the sense of delicate inner workings, have stayed with me—gratifying and emboldening. I needed this. Sometimes life is gridlock. And then a song pulls you outward, gives you a way toward walking. Some songs move out of black holes and into the sun.